As soon as the chyme has passed from the stomach into the intestine it excites the flow of bile from the liver, of pancreatic juice from the pancreas, and of intestinal fluid from the numerous Lieberkuhnian follicles and glands of Brunner that are distributed through the mucous membrane. All these fluids are alkaline, and hence the reaction changes, so that from being acid the chyme becomes alkaline. The bile not only neutralizes the acidity of the latter, but it aids in the emulsi-fication and saponification of the oils and fats. It also promotes their absorption, and it acts as a stimulant to the muscular walls of the intestine, causing them to contract, and assisting in this way the onward movement of the intestinal contents. It seems to interfere with or arrest the further action of the gastric juice on the proteids. That action, however, is recommenced by the pancreatic juice, which can form soluble peptones from the insoluble proteids in an alkaline medium, just as the gastric juice did in an acid one. The pancreatic juice is in fact the most important of the digestive fluids. Comparatively small in quantity, coagulating into a solid mass by heat, it is found to contain three ferments, named trypsin, steapsin, and amylopsin. Trypsin converts proteids into soluble peptones, but in a somewhat different way from that in which the change is effected by gastric juice, and it can carry the change one step further by decomposing them into leucin and tyrosin. Steapsin possesses the power first of emulsionizing and then of saponifying the oleaginous compounds, thus aiding in their absorption; and lastly - the amylopsin effects similar changes in the starches to those which we have just seen are accomplished by the saliva. Fig. 91. 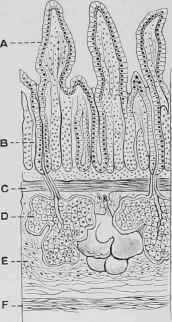 - Section through the Duodenum, showing Brunner's Glands. a, Villus. B, Follicle of Lieberkiihn. C, Muscularis mucosae. D, Brunner's gland. E, Connective tissue. F, Muscular coat. The intestinal juice appears to have an action resembling, though less powerful than, that of the pancreatic secretion, acting upon all the organic constituents of the food, rendering them soluble and aiding in their absorption. From the small intestine the now greatly modified food mass passes into the large intestine; and when the enormous capacity of the caecum and colon are considered, it is difficult to avoid the conclusion that a still further effort is made to convert the materials that have hitherto successfully resisted the warmth, moisture, and powerful action of the several digestive fluids secreted by the salivary glands, the stomach, liver, pancreas, and intestinal mucous membrane, into useful nutritive substances, and at the same time to effect their absorption. A considerable development of infusory animalcules, as well as of micro-organisms in the form of bacilli and micrococci, takes place in the large intestine. This subject may be concluded by giving the results of the observations of Colin in regard to the progress of the food through the alimentary canal. He kept the animals fasting for twenty-four hours from solids and liquid, then fed them with about 5 1/2 lbs. of hay, and about 2 1/2 gallons of water, to which must be added an estimated equal quantity of saliva, and killed them at different periods. Two hours after the beginning of the meal the stomach had passed into the intestine one-half in weight of all that had been ingested; two-fifths of the dry hay had been retained, the remaining three-fifths had entered the small intestine, but one-fifth only was contained in the small intestine and caecum, the missing two-fifths having been dissolved and absorbed. There was a great excess in the fluid owing to the addition of the gastric, biliary, pancreatic, and intestinal fluids. In another horse killed under the same circumstances, three hours after the meal a larger proportion of the solids had been absorbed, had entered the small intestine and had been passed on to the caecum. After five hours only half the hay supplied could be recovered from the stomach, small intestine, and caecum, the other half having been either dissolved and absorbed, or transmitted to the colon to be quickly ejected as excrementitious matter. Colin found some remains, though small in quantity, in the stomach after even so long a period as 36 or 38 hours. It would appear, then, that very soon after food is ingested it in part passes through the stomach and reaches the intestine and caecum, in all of which digestion is simultaneously proceeding, the fluid that is added to it by the glands being least in the stomach, very large in the small intestine, and immense in the caecum, and that absorption is taking place of the dissolved material in all these cavities. PLATE XXIII. STROXTON TOM 15871. 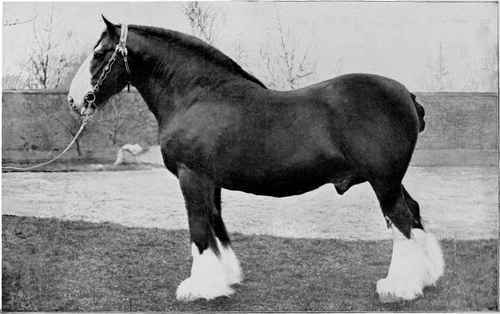 Bay Horse by Honest Tom 5123; dam, 20944 Stroxton Diamond. Winner of the Challenge Cup, S. H. S., 1903, and numerous other prizes. The Property of James Forshaw, Esq.